So, the nice HP Chromebook 11 that my wife has seems to have a design fault. If you let the battery run flat, the Chromebook will no longer charge. Symptoms are that there is no charging LED, and no matter how many hours you leave it with the charger plugged in it simply will not charge the battery. It won’t switch on either, so you can’t even use it plugged in style! Ideally, you’ll want to recharge the thing every time the battery drops to 20% or so to avoid this issue but here’s what to do if you do manage to kill your Chromebook by letting it run flat. Now, with the charger still plugged in reconnect the battery connector. The red LED will turn back to orange, and the Chromebook will start to charge. 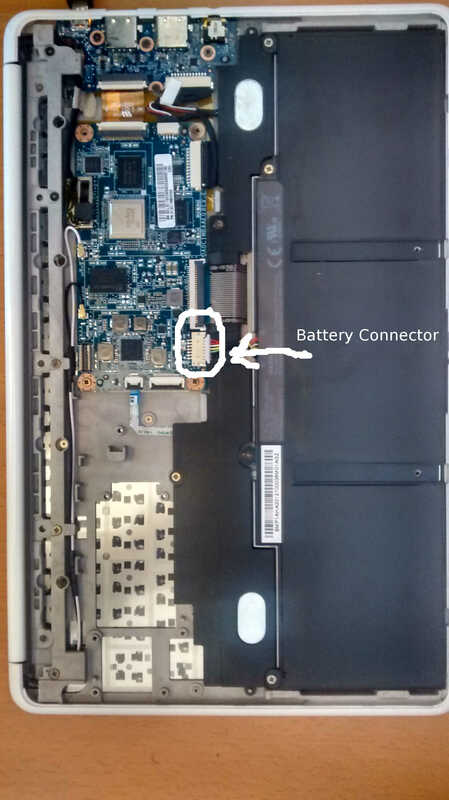 Once charging is complete (indicated by the green LED), you can remove the charger, replace the cover, screws and coloured panels and enjoy your Chromebook again. Just don’t let it run too flat in future! Good spot. I’ve fixed it now! Can you please help me,I’ve done this 3 times now, the orange light is just blinking on and off but it is not turning red, What else can I do? Maybe you have a different model of Chromeook. This guide is just for the 2013 edition of the HP Chromebook 11. I’ve did this 3 times now, the orange light is just blinking on and off but it is not turning red, What else can I do? With the battery disconnected completely, the light should turn red. If you’re seeing blinking orange instead of steady when you reconnect the battery it could be that the battery has become faulty. They don’t last forever and if you’ve had your Chromebook a while it might be exhausted. Not true! When we charge the battery our light goes red to show it’s charging. So, this is not true for all HP Chrome books. This article is specifically about the HP Chromebook 11 released in 2013, with the Samsung processor. HP have since released a new 11 inch Chromebook, using an Intel processor so that is probably what you have. Hi there, if I use this method because the laptop would have been opened up, is the warranty voided? I still have a years full warranty, yet I also have the EXACT problem you are describing. Great post by the way! I suspect that opening the case will void the warranty. If it’s still in warranty, then you might as well claim on that. This model of Chromebook was first released in 2013 – maybe they’ll swap it for a newer model under warranty instead! Steady orange means it’s charging. It should turn green when it is full. My Chromebook 11 (not sure of the vintage) was in the box for a number of months. I was not aware of the charge issue. Today I attempted to revive it to set up a new Chromecast. After eight hours on the charger, it started and ran long enough to log on and start the Chromecast setup then died. The charging light changes from red to amber go green to off in a random pattern. Any suggestions? If you’ve not already tried the steps in this article, it might be worth a try just to see if you can persuade it to charge. If you do get a steady orange light, leave it for a good few hours until it turns green before trying to power on the Chromebook. If it still flashes randomly, you might need to replace the battery but check the price of that versus a new Chromebook first. It might not be economical. This is what my one does. I have done this method and the led night changes from orange, to blank, and then to green then red. What does this mean? I suspect it might mean your battery is no longer holding enough charge and needs to be replaced. So far so good. letting it charge now. Thanks Dan! Great article I had this problem a few years back and this guide solved my chromebook not charging. Still using the chromebook 11 1st gen as my daily personal laptop. The only new chromebook I see as worth buying are the Samsung chromebook Pro or the Google pixel (discontinued) both of which are out of my budget. So the Google hp chromebook 11 is the next best thing in terms of design (excluding this fault) and aesthetic. I just went through the process to see if it would stop the Chromebook from showing a flashing amber light when plugged in to the charger. When I got inside the Chromebook, I found that the battery cable to the system board was unplugged! Plugged it back in and viola! Working fine once again. Amazing how something like this can come undone! Still a useful post three years after you wrote it. Thanks! My HP 11 G2 will flash orange then red then green then back to red. I’ve been searching for a while about this, but with zero results or answers. I might just buy a new battery and charger since it’s been dead for a couple years. If anyone has any ideas please tell me. i hate hp chromebook 11. just because the batteries run out flat, it refused charging till now. too bad. Yes, worked, I had just about given up on the old girl. Great, useful post. Although I could only confirm my battery has died, it was still useful to check for any flaws. Should I be able to power on the Chromebook without the cover on? Trying to troubleshoot 2 of these bad boys that are having trouble charging and powering on. Yes, if you’re careful that nothing touches the motherboard, you should be fine. Watch out for rogue screws and screwdrivers! I was painful, but mine started charging after follow your directions. After unplug the Battery and connect and disconnect the power adapter multiple times, I just wanted to add these steps if for any reason what Dan shared does not work on your Chromebook. – I followed all steps and I tried to hard reset it without luck. – Then, with the battery disconnected but the power adapter connected, I started to press the power button for 2 seconds (you can see the light gone off while you’re pressing the power button) and check if the light changed from blinking orange to steady orange. – After a few attemps the light finally return this time STEADY ORANGE, then wait until the ligth went to RED (yai!!!). Now, with the power adapter connected I re-plugged the battery connector and FINALLY the light went from RED to STEADY ORANGE and started charging. I had the same experience with my old Chromebook (got an end-of-life notice about the OS lately. I’ve had problems for a couple years with charger cords. They would work fine for a while, then seemed to get loose and would only charge when I found just the right position. I tried the disconnect/reconnect thing a week ago to no avail. I’ve got another Chromebook on the way but wanted to get all the data off this one before sending it to the environmentally unfriendly waste site. This time I paid attention, removed the battery interface, plugged the charger cord in and moved it slowly until, voila! the yellow charge light came on, followed by the red light. I connected the interface again and the LED went out. DAMN! A few minutes later I did the same thing and this time, when I plugged the interface back in, the LED changed to yellow. I carefully left everything exactly where it was. When I get it fully charged, I’ll go about transferring everything to a thumb drive and I’ll delete all my files and folders before doing a powerwash. Fingers crossed on the new chromebook. I love these things. I know people badmouth HP but mine has been virtually indestructable for 6 years and I’m sticking with them.